The memorable joke in the chorus is about marijuana (although it could just as easily be about alcohol), but the song as a whole is about persecution, specifically criticism, and the message in the chorus is a straightforward one: it happens to everybody, so don’t feel bad (and, implicitly, don’t be such a victim about it). The combination drunk party/revival meeting sound of the song is wonderful, a product of the unique musical chemistry Dylan and the Nashville studio musicians (under the leadership of Charlie McCoy and producer Bob Johnston, with help from Kooper and Robertson) achieved during these freewheeling ses- sions. This is not country music. This is not Dylan music as defined by any earlier Dylan album. 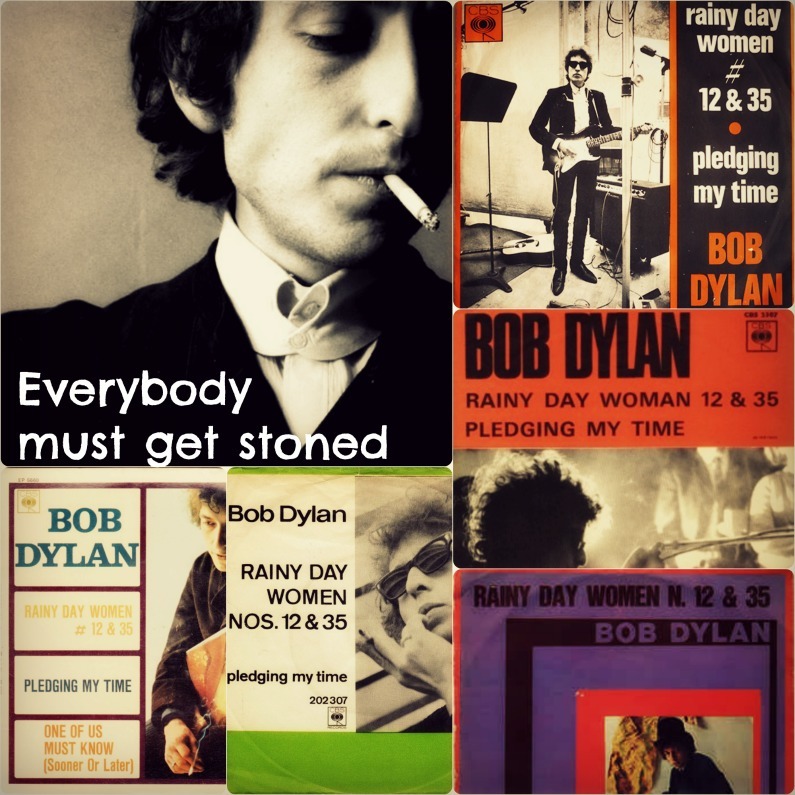 It’s only rock and roll in the broadest, most all-encompassing sense..
“Rainy Day Women ♯12 & 35” is a song by Bob Dylan. 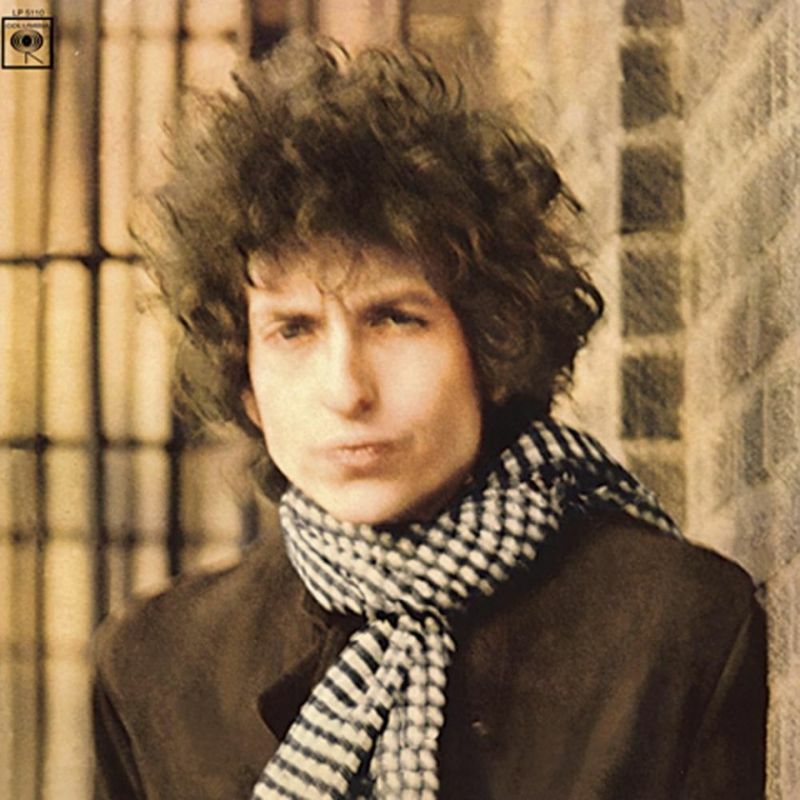 It is the opening track of his 1966 album, Blonde on Blonde. It was initially released as a single in April 1966, reaching No. 7 in the UK and No. 2 in the US chart. “Rainy Day Women”, recorded in the Nashville studio of Columbia Records, features a raucous brass band backing track. The song’s title does not appear anywhere in the lyrics and there has been much debate over the meaning of the recurrent chorus, “Everybody must get stoned”. This has made the song controversial, being labelled by some commentators as “a drug song”. According to Al Kooper in Backstage Passes, it was not actually Dylan’s idea to turn the song into a revivalist sing-along: ‘Dylan was teachin’ us [the] song one night when [producer Bob] Johnston suggested it would sound great Salvation Army style. Dylan thought it over and said it might work. But where would we get hornplayers at this hour? “Not to worry,” says Charlie McCoy and grabs the phone. It’s 4.30 a.m. when he makes the call. . . . At 5 a.m. in walks a trombone player. . . . He sat down and learned the song, they cut three takes, and at 5.30 he was out of the door and gone.’ Actually the song appears to have been cut around one in the morning, but that’s close enough for Al. -Heylin, Clinton. Revolution in the Air: The Songs of Bob Dylan 1957-1973 (Songs of Bob Dylan Vol 1) (pp. 309-310). Little, Brown Book Group. Kindle Edition. Bob being Bob once described it as “a Portuguesefolk song”. The symbolic stoning is certainly biblicalin nature, and Dylan was getting hit with plenty, be they cast from the press or fans screaming “Judas!” Scholars have come up with various interpretations: one claims it’s about Dylan’s mother, whose maidenname was Stone. But Bob reportedly heard Ray Charles’s Let’s Go Get Stoned right before writing it. Time Magazine (mistakenly) claimed a “rainy day woman” was a “marijuana cigarette”.The 4am recording sounds like one helluva party. So the simplest interpretation remains the world’s gonna getcha… so you might as well get stoned. helpfully point out that 12 times 35 equals 420, maaan.